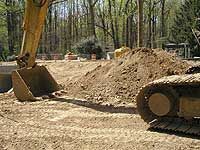 Before you invest time and money in a home landscape project, consider a soil sample test. The soil sampling provides useful information on the chemical composition of your lawn or garden area. The sample results determine if you have acidic or non-acidic soil. And, if areas need to be amended with fertilizer or organic material to ensure the plant material will thrive. If you live in Virginia, contact the Virginia Cooperative Extension at Virginia Tech University. For readers in other states, contact a local Master Gardener Horticulture Office. Before any landscape project begins, contact your Utilities company so a representative and indicate location of cable, electrical and other lines.